Its no secret that Evelyn is a huge fan of L.O.L Surprise and has been growing her collection for a while now. She adores these miniature dolls and has got quite the collection going now which she plays with every single day without fail! 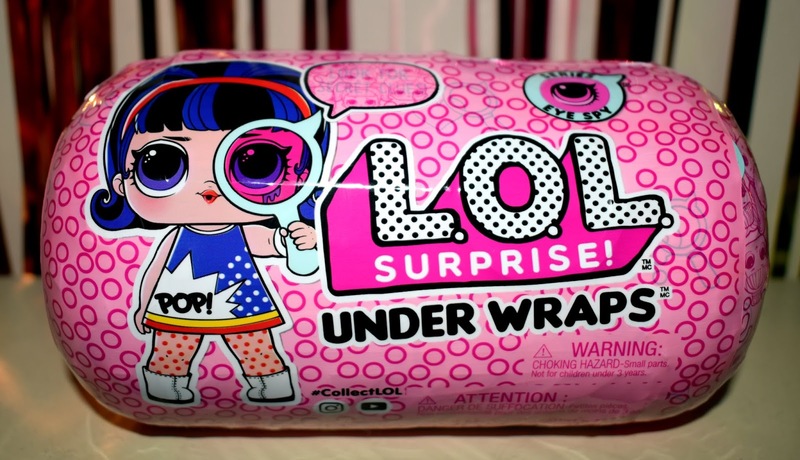 So you can imagine her excitement when she was recently offered the chance to try out a brand new L.O.L Surprise doll from the under wraps series 4 collection. The L.O.L Surprise Series 4 Under Wraps collection is the newest collection out at the moment from MGA Entertainment and you can currently purchase wave 1 capsules each containing 15 surprises! There is a big change noticeable straight away with the new under wraps series, they no longer come in a ball! Instead they come in a long rounded capsule instead. You will still find multiple layers to unwrap but be sure to use the magnifying glass you will find under the first layer to check for clues on each layer of packing as you unwrap it. After unwrapping your capsule and finding your doll you will be able to use these clues to work out a coded letter. Under each layer will be a new surprise, the first layer will contain your magnifying glass to check for clues and then under each new layer you will find more surprises including a clue sticker to indicate which "club or group" your doll belongs to and a sheet of codes (keep these as you will need them to open the capsule!). 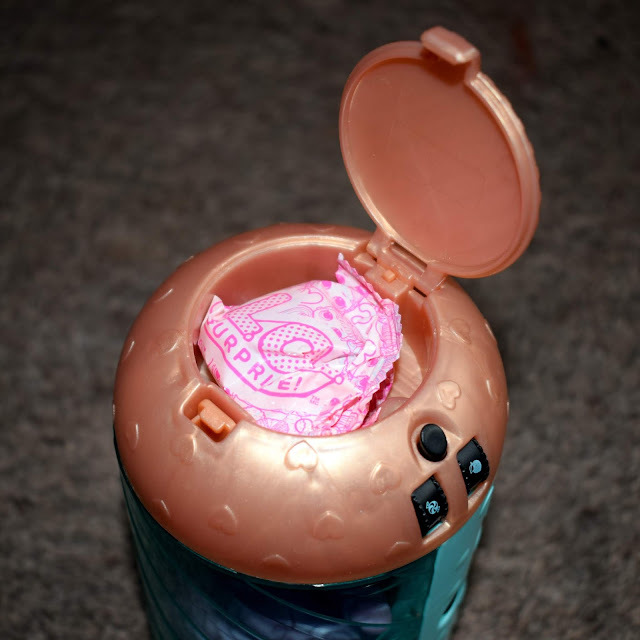 Once you have opened all of the outer layers you will find a capsule with a clear window in which you will be able to see a doll, although you won't know which doll you have yet as she is wrapped in a mysterious jelly surprise. This is where you will need the codes, the capsule has four different codes to crack by trying the codes on the card you found earlier. As you crack each code a new door will open revealing a surprise such as your dolls outfit, shoes and even a water bottle. The last code opens the main door which then releases your doll! Once your doll is released you can carefully peel away her jelly disguise and reveal which doll you have found. If you wanted to you can even carefully separate the jelly layer into a new outfit, we separated ours into a top and tail (perfect for when Evelyn wants to put her in the water for a swim). The edges are slightly thinner making this quite easy to do however younger children may need so help so that it doesn't get torn. 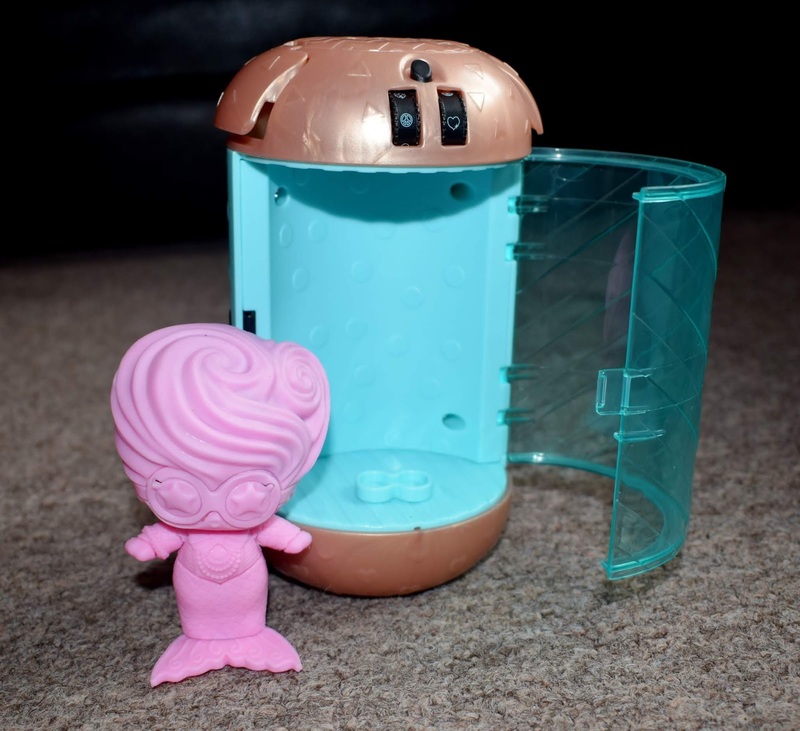 Inside the main capsule door, as well as the doll you will also find your collectors guide and a handle to attach to your capsule so you can use it to carry your new doll in. We got Caddy QT! Who came with a very sweet pale pink outfit, pale purple shoes and water bottle as well as a white sun visor. Evelyn was so excited and couldn't wait to get her all dressed up and introduce her to the rest of her collection! The attention to detail on these dolls is pretty impressive. She has tiny detailed tartan style socks/tights painted directly into her legs, purple eye brows and even little eye lashes. Purple is also Evelyn's favourite colour so she was pretty excited to get a doll with purple hair! The new L.O.L Surprise Series 4 under wraps dolls are a little more expensive than the previous series at £15 per doll and I had been apprehensive about purchasing them at this price. 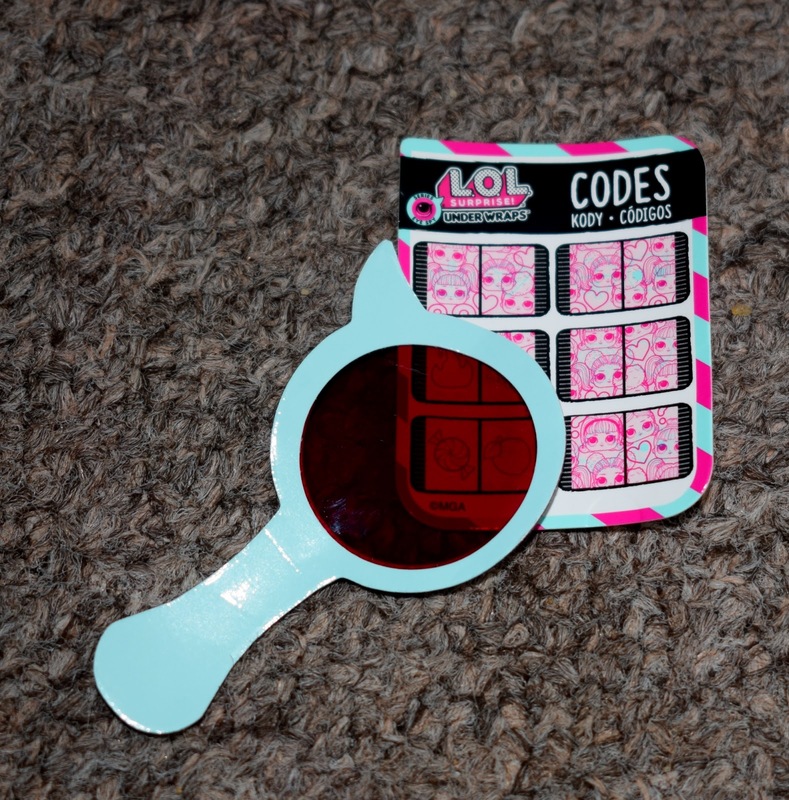 However having the codes to crack made the whole experience of opening her L.O.L Surprise doll last much longer and she was so excited I couldn't resist buying a few more to hide away for Christmas for her. L.O.L Surprise dolls series 4 under wraps dolls are available to purchase from Smyths, The Entertainer, Argos and online at Amazon. 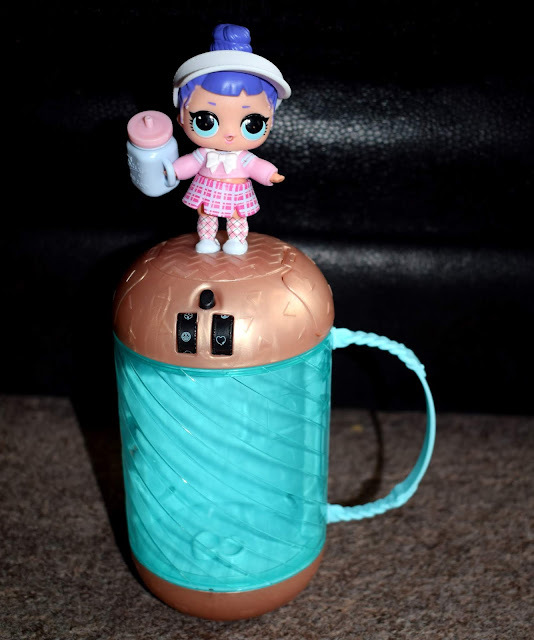 Do your children love collecting L.O.L Surprise dolls? Do they have a favourite doll from any of the collections so far?